Daisy's beautiful bows arrived today...WOW...they are gorgeous! 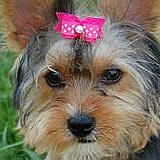 I have had Yorkies for twenty years & have purchased many many bows. Even though some have been very pretty, none have been as well made & beautiful as yours & for a reasonable price. Not only are they beautiful but they arrived in perfect condition. I also want to thank you for the very generous free bow & bands you sent...that is something I have never experienced. 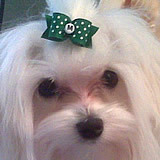 It's so funny, I usually order bows to match Daisy's outfits...now I will be making her a dress just to match the bow you sent...I love it! I will now be purchasing all of Daisy's bows from you...thank you for making such a quality product for us. 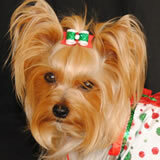 I will be sure to spread the word about your awesome site to all my Yorkie lover friends. You should be very proud of yourself...you make a lot of fur-mommies very happy! The bows came today and they are beyond beautiful! I am shocked at their quality and precision. Thank you SO much for the lovely and unusual craftsmanship and care. I was so happy too get our box of bows! so well made and very pretty! megan, ashley and star well look so pretty!! thank you! I will definitely order from BowBiz again! I just received my order of bows today and wanted to give you a BIG thank you! They came packaged so very nicely and to top it off, I didn't think it was possible, but they are even cuter than shown in the pictures! My Shih Tzu, LuLu, is going to be the most fashionable girl this summer! I will definitely order from BowBiz again! Thank You so much for the beautiful bows Susan! I just received them today, and I used your helpful tips to put one in for her. 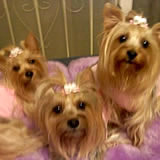 They are amazingly cute, and of the highest quality, I know where I will be getting CoCo's bows from now on! 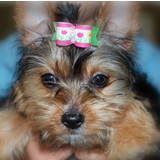 Thank you so much for the extra bow and grooming bands! It was incredibly thoughtful of you! I absolutely LOVE BowBiz Bows. This is the only place that I will order my bows from. They are amazing quality and my favorite thing about the bows is the fabric stiffener that keeps the bows in perfect shape and will last a very long time to come. I love showing off Pita's beautiful bows!! Susan, they arrived yesterday and once I bathe these dirty girls, I'll have them model the bows. But I wanted to tell you how pleased and impressed I am with the impeccable quality of your workmanship. I've seen bows and I've seen bows. Yours are top of the line. I just wanted to let you know I recieved my bows. 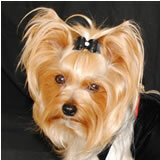 As a retired dog Groomer I have seen alot of bows. I have to say I have never seen a bow more well made then yours. They are amazing. The pictures on your site do not do them justice. Thank You very much for the extra bow and bands, I love them too. Gavyn and I will be only ordering from you for all our bow needs in the future. We are raving fans; I cannot believe that we have not posted a testimony before now. A picture is worth a thousand words so attached please find three. We were vacationing in San Diego, CA but not before packing our BowBiz Bows for the trip. Susan is a delight to deal with and her bows are always very, very pretty and well constructed too. 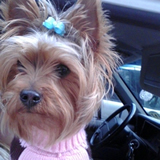 Our bows withstood doggie daycare and coast to coast travel too. Thanks plenty Susan! 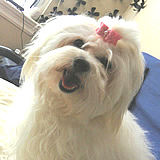 We like very much the bows of BowBiz for our dog Rose. There are very beautiful. Thank you very much Susan. 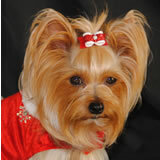 I have been buying bows for longer than I can remember and I have never written a testimonial. I just received my first order from BowBiz and I am completely impressed, to the point where I actually decided to write to you. I usually buy bows from one bow-maker for a while and then try someone new but now there will be no more experimenting for me. After all these years, I can't believe I have found the perfect bows! The quality of your bows and your workmanship is absolutely amazing!!! (I also think that you are underpriced by far for such a superior product - but I am not complaining.) I have bookmarked your site and will be shopping EXCLUSIVELY at BowBiz from now on. I am SO happy that I stumbled across your website. Thank you so much! Thanks for the recent orders for Beamer. The beauty and durability of your bows never ceases to amaze me. And they are always packaged so beautifully. 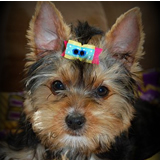 Beamer just looks so good in the bows, and I find the alligator clips are a lot easier for me than the bands. I am attaching a recent photo of Beamer. "There's no biz like BowBiz! ", that says it all!